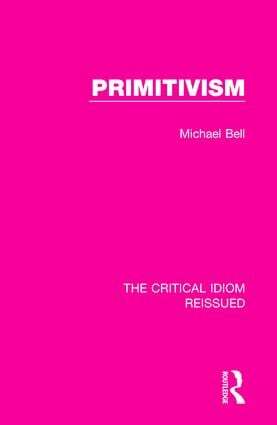 First published in 1972, this books examines the subject of primitivism through the study of the work of a number of major writers, including D. H. Lawrence, Herman Melville, Joseph Conrad, T. S. Eliot and James Joyce. It looks at the variety of definitions and uses of primitivism and how the idea has changed over time as well as with each writer. In doing so, it is argued that primitivism denotes, or arises from, a sense of crisis in civilization and it is born of the interplay between the civilized self and the desire to reject or transform it. This book will be of interest to those studying modern literature. Acknowledgements; General Editor’s Preface; Introduction; 1. Primitive Sensibility 2. Conscious Primitivism 3. The Historical Context 4. The Primitivism of the Critics 5. Conclusion and Further Directions; Selected Bibliography; Index.